I can't believe I have spring fever already, it's way to early for that! I bought some seeds already from my local greenhouse, I just couldn't resist. I swear I have never had the fever this early! Come on spring time!! Planning my greenhouse and shed are also causing me to want to get out and start working in the yard, this weekends temps are looking like upper 50's, man, it's going to be hard to stay inside this weekend! While trying to curb my spring fever I have been reading tons, mainly garden books, which was not much help, but thank goodness I found "Final approach" last month, it helped me focus on something other then the garden for right now. I found it last month in my favorite little bagel shop, it was released into the wild by another reader, (check out http://www.bookcrossing.com/ for information on this group) I am glad I found this book, it was not a book I normally would have picked for myself, but I really enjoyed it. 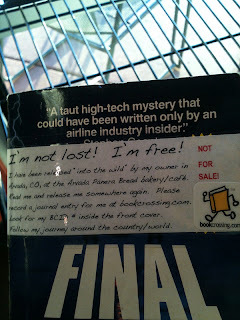 Finding this book brought me into the world of bookcrossing.com which I am already addicted to, I am hunting out places to find more released goodies! I can't wait to release this book back into the wild, as well as a few of my favorites I want to share. Have a super day, enjoy the sunshine, and do something you love!